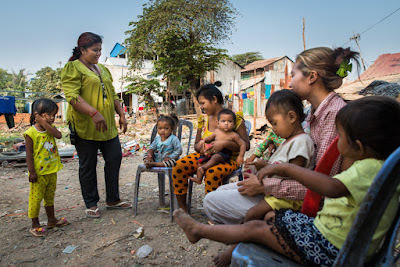 “Bring your child for free vaccines tomorrow!” Sokly Ye, a robust 44-year-old woman, called out to passers-by as she slowly drove her motorbike down a narrow dirt road lined with small, ramshackle homes. 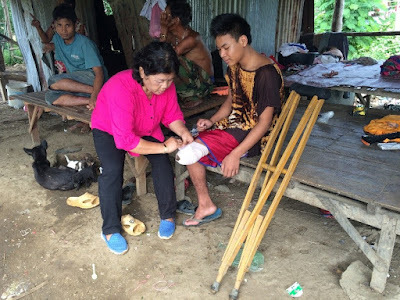 how to bandage his stump in preparation for his first prosthesis in November 2016. Phnom Koy village, Pailin province, Cambodia, December 2016: Pailin province borders Thailand in the east of Cambodia. It is one of the post-conflict provinces heavily contaminated by landmines and explosive remnants of war (ERW) left over from the civil war that raged from 1979 to 1992. The Cambodian Mine and ERW Victim Information System of the Cambodian Mine Action Authority recorded a total of 64,000 casualties between 1979 and 2016. Pailin accounts for 25 per cent of the total casualties, and one in every five of those are children.